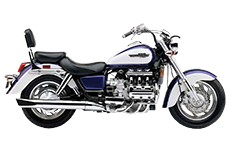 A classic cruiser, the Honda Valkyrie Tourer 1500 motorcycle is a legend in its own right. Riders know exactly what kind of styling to approach, and how it can drastically change the appearance of their bike. When it comes to saddlebags, the Viking collection of luggage designed specifically for these bikes is wide enough to offer riders a variety of different choices. From studded to plain and slanted to straight, you'll find the perfect pair here in our online inventory. Browse through each page for more information, or give us a call with your questions.